Blood clot. Illustration of blood clot (thrombus). 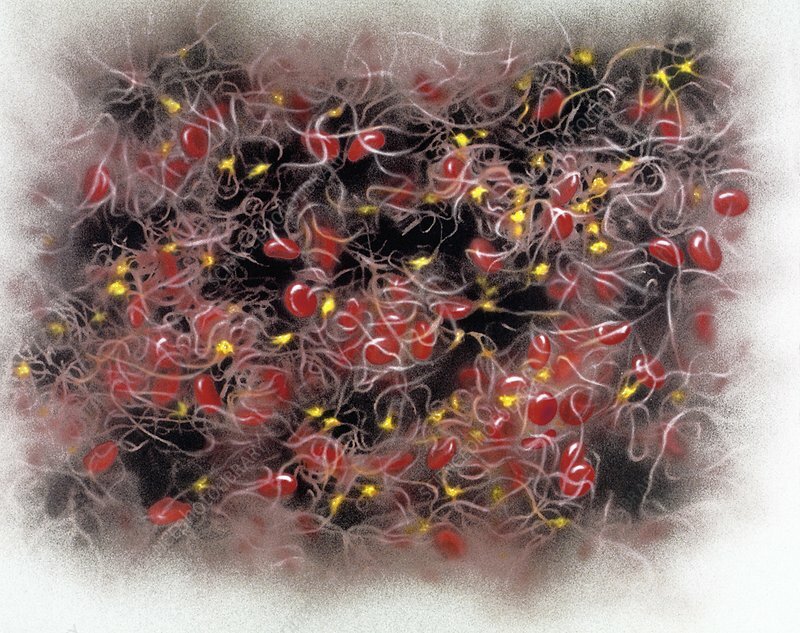 The clot consists of threads of fibrin (yellow), an insoluble protein. These form a mesh which traps the disc-like red blood cells (erythrocytes). Clots like these form when the skin is broken, in order to prevent loss of blood. Internal clots can also form in intact blood vessels. This can be triggered by events which will result in slow blood flow such as, prolonged bed rest, heart failure or major surgery. The main danger is that part of the clot may break off and be carried around the body in the blood stream. This could cause a heart attack or stroke.